First introduced on the market in 2014, during Apple Worldwide Developers Conference, Apple’s proprietary software and hardware smart-home platform has gradually improved. New features were added and more devices were made compatible, allowing homeowners to easily communicate with their smart appliances and control what is going on in their home via their Apple device – a smart phone, a watch or an iPad. So, how does it work? If you have a smart home equipped with the Apple HomeKit, you can control various devices in a few quick commands using the specific app on your phone or even via Siri, the personal assistant Apple offers. Depending on the compatible hardware you have, this means you can control smart devices like thermostats, lighting, and even home security cameras and alarms. With Apple HomeKit, your house keys are one step closer to becoming a museum artifact. Smart locks have a huge potential to replace traditional ones in the near future, and there are a number of reasons for this, including comfort, ease of use, enhanced security, and peace of mind. Features vary depending on the hardware manufacturer, but there are quite a few things most smart locks have in common. The most important is the ability to lock and unlock doors with the mere tap of an icon. Another useful feature is the possibility to add different types of users and assign permanent or temporary permissions for them. For instance, if your cleaning lady comes every Tuesday and Friday, you might want set up a specific access schedule for her, allowing her to enter the house only on those specific days and at the agreed hour. Another aspect worth taking into consideration refers to activity logs for those cases when you want to see who entered or exited your home. This usually comes with the option to set email or SMS alerts in case of a forced entry. Voice activation is another interesting feature, allowing you to lock or unlock your door with a voice command that you have set yourself. If you have the habit of constantly wondering whether you locked the door or not, you might be interested in getting a smart lock that provides a geo-fencing feature. This way, you can create a setting that enforces doors locking when you get away from your house. A similar setting can ensure automatic door locking when inactive for a specific period of time. Some smart lock products are Bluetooth-enabled. What you have to know before purchasing such a product is that you will have to be within a certain range in order to be able to communicate with your lock. On the other hand, locks equipped with a Wi-Fi bridge can be accessed from anywhere on the condition they are connected to your home internet connection. Easily installed by attaching a mounting plate to your keyed cylinder deadbolt, August Smart Locks offer auto-lock, geo-fencing, voice commands, as well as an interesting If This Then That (IFTTT) feature. IFTTT allows you to set push notifications for different actions, as well as trigger other smart devices connected within the same system. Although it offers a wide range of interesting features and two options of design, Schlage Sense has one drawback: it is built on Bluetooth technology, so you will have to be within the 40 feet range to access it via your iPhone, iPad, and iPod. Outside of this range, remote control is possible only through Apple TV. Offering a slick design and the flexibility to be installed on a variety of door models, the Poly-Control Danalock V2 offers a handful of features, including TwistAssist and Knock to Unlock. A recent addition to the range of smart locks products compatible with Apple HomeKit, Yale’s iM1 Network Module can be accessed via iPhones, iPads, and Apple Watches. An interesting feature is the possibility to manage up to 25 PIN codes, and the ability to customize lock settings. While less rich in features than its competitors, Lockitron Bolt deserves a mention. It is an affordable option for those who want to have a smart lock system at a low price, and for whom features like auto-lock are not as important. You should also know that for the time being, Lockitron Bolt does not offer the ability to connect with other smart devices. Security Cameras are probably the most important security devices to connect via Apple HomeKit. Whether you want to monitor your kids’ activity while you are not at home, keep your home safe from break-ins, or just see what your pet is doing when left at home, smart security cameras are the way to go. Not only will you have your home a tap away, and store the videos for later review, but you can also create scenes and trigger actions for other connected devices. Apple’s official security camera for the HomeKit provides users with a live stream that can be viewed at any time on their iPhone or iPad devices. Suitable for indoor and outdoor use, the camera offers live streaming, two-way audio, and recording of the most recent 24 hours. If you need to extend the recorded time, you can do so via a subscription service. With a 180-degree field of vision and night vision settings, the camera offers a full HD recording of your home, providing you with instant alerts should there be activity in your home. A non-mounted camera that discreetly tucks away into any room, this product offers much of the same features as the Logitech Circle 2, including 180-degree field of vision, 1080p HD recording, two-way audio, and night vision. It also features a slot for a micro SD card, allowing you to record plenty of footage to play back whenever necessary. It can be controlled using the Home app or the Omna app, both of them providing alerts and footage for any security issues. Developed by smart camera manufacturer Canary, the Canary Plus is a HomeKit compatible smart security camera that is the second version Canary is putting out this fall. While there have been no official specifications released, based on their previous smart cameras, we can expect features such as a full HD camera that sends video and audio footage to your device, while air sensors and a built-in siren may also be included. 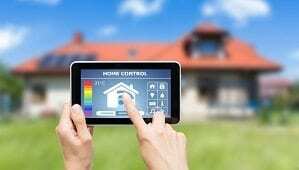 When talking about smart lights, most people think more about interior design than home security. However, smart lighting can also help you in the security department. Along with allowing you to connect your home’s lighting with the activity going on in the room, you can also set a schedule and alternate lights while you are away so that neighbors do not notice the house is empty for a long period of time. Smart sensors are another important type of device you can connect to your Apple HomeKit if you want to know that your house is safe from intruders as well as from calamities such as fire, water, and gas leaks. Many such systems come also with sound alarms that would alert anyone in the area, as well as sending push notifications to your phone and email alerts. Elgato Eve Door & Window is probably the best option here. The brand’s official sensor provides you with info straight to your iPhone or iPad, related to doors or windows being open or closed. In a nutshell, Apple HomeKit provides a wide range of features meant to boost your home security as well as to ease your mind off all sorts of risks. Bringing you one step closer to the concept of smart home, Apple’s platform will certainly make your life easier, allowing you to control most of your home devices from your smart phone. To learn more about home security, check out these reviews of the top-rated home security systems on the market.